About 200 hedgehogs have been killed in an annual cull of the animals in the Outer Hebrides. Scottish Natural Heritage (SNH) said it could take up to 10 years to cull the creatures not native to the islands. Anti-cull group Uist Hedgehog Rescue (UHR) said public money was being wasted on the operation and the final bill could exceed £1m. 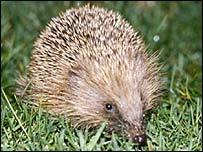 The hedgehogs are being killed because they eat the eggs of important species of ground nesting birds. The total of non-indigenous hedgehogs in the Western Isles has multiplied to about 4,000 since a handful were introduced in the 1970s. When they come out of hibernation they eat the eggs of internationally important birds - including the lapwing, redshank and ring plover - which breed on the islands. UHR spokesman Ross Minett said it had received a letter from SNH director Dr Jeff Watson stating the cull could continue for a decade. The letter said: "All of the data is being used to assist in modelling the effort and cost of eradication of hedgehogs from Uist. "It is anticipated that the project will cover a period in excess of 10 years, although a model is currently being refined to identify details of this." Dr Watson also said the issue of relocating hedgehogs to the mainland could be re-examined if credible scientific evidence supporting the move came to light. Mr Minett said the annual cull was unfairly hitting the public purse. "It is now looking like the final bill will soar past the £1m mark," he said. "The truth is SNH does not know how long it will take or how much it will cost. It is crazy and unethical that these animals are being killed, especially as hedgehog populations are declining across the rest of the UK." SNH has said culling all the hedgehogs in the Western Isles was more humane than relocating them to places where they may have to compete with existing populations. About 181 hedgehogs were killed by lethal injection in the spring cull and at least another 15 in the autumn operation, which ended last Friday. UHR said it saved 241 hedgehogs this year - bringing its three-year total to over 600. It plans to relocate the creatures to suitable mainland sites.